We are a rigorous, peer-reviewed academic journal that supports the professional development of TESOL teachers and scholars. Thus, articles should be both grounded in current theory and research and also accessible to a wide readership. Our readership consists of practicing teachers, teacher trainers, and teacher-scholars. Most of our readers have already obtained (or are working toward) at least an MA or credential in the field. We aim to publish articles that highlight implications for classroom teaching and teacher development. Our readers are looking for pedagogical implications; for findings that can inform their teaching and teacher training; and for insights and conclusions that may make them rethink, add to, or change they way they teach. We are a rigorous peer-reviewed academic journal. However, we also are a mentoring journal; we support the professional development of new scholars. If a submission is appropriate for our readership and shows a degree of theoretical grounding/rationale, our editorial advisory board will work with the author on revisions until the manuscript is ready for publication. These articles focus on theory, research, pedagogy, and/or educational policy. These articles should make an original contribution to the field of education. No research or argument grows out of a complete vacuum. You should not try to show that no one has done research about your topic. You need to show how your specific focus will add to the existing research on your topic. These articles should provide readers with insights that they can generalize to their own educational settings. Do not overgeneralize but do share with readers what they can take away from your research or argument—or what they should think about or think about doing as teachers, teacher-scholars, teacher trainers, and/or program administrators based on your conclusions. 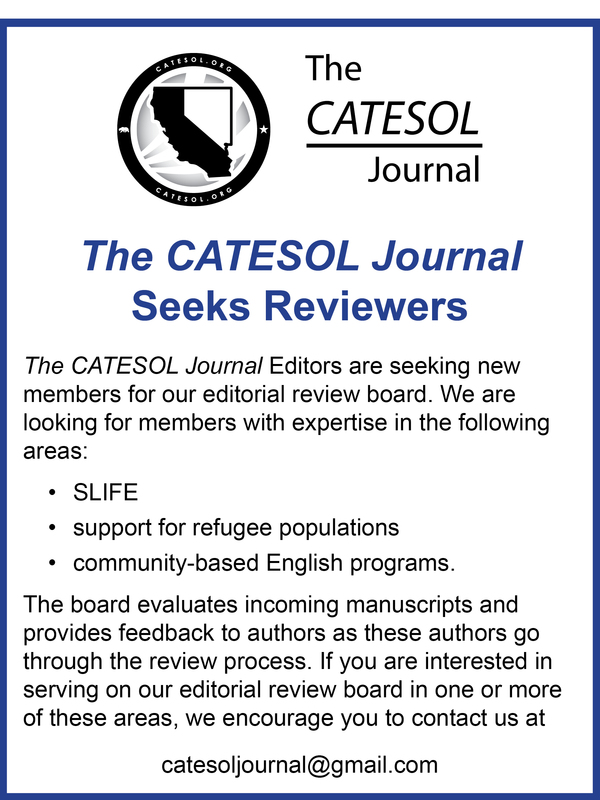 The CATESOL Exchanges section provides a forum for articles that are can be briefer, somewhat less formal, and/or less heavily referenced than traditional research articles. The format of CATESOL Exchanges is flexible, allowing for the investigation of topics that might not fit into the constraints of a “traditional” research article template, for example, discussions of curricular changes; effective instructional techniques and classroom practices; teacher-development projects; or arguments concerning theory, research, or policy. 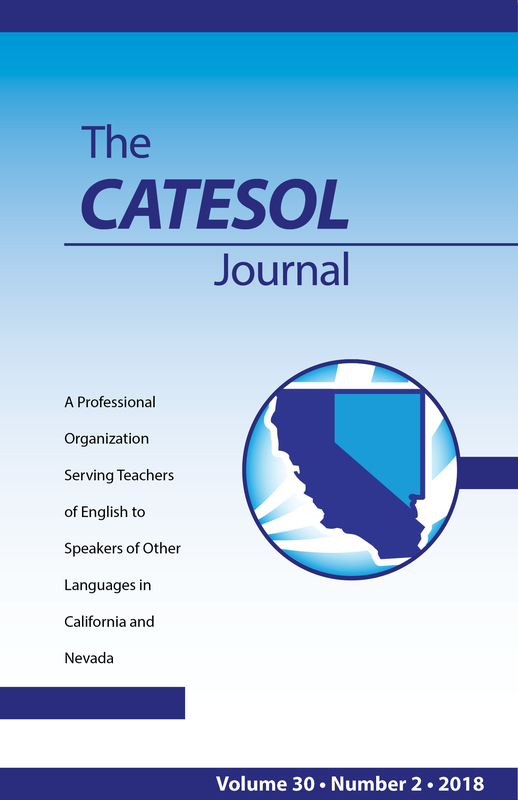 The CATESOL Journal periodically features a selection of articles that are written by graduate students and that focus on various aspects of the graduate experience: professional development, the theory-to-practice connection, socialization into the field, and so on. Because we are a California/Nevada organization, articles should also be relevant to our local teaching contexts. In each issue of the Journal in which Graduate Student Perspectives appears, the section will have a slightly different graduate student theme. The graduate theme section editor will provide assistance in submitting and preparing your article. How do I cite my own work? Please do not use the word “Author” in in-text citations or references; just craft citations and references as you would for any source. The TESL community is a small one, and there is a good chance your reviewer will have read your work and thus know who you are. Please do not include any institution or acknowledgements. If the manuscript is published, you can provide necessary information to our copyeditor. Can I submit empirical research? The introduction to the article should frame the issue for a wide readership rather than a specific subfield within TESOL. General readers need to know what you’re focusing on, why you’re focusing on it, and what’s at stake. Articles should be grounded in current research and theory and contain a short and succinct literature review or background section. This section should be addressed to a general readership, not just scholars in the subfield of the article. And, unlike a seminar paper in graduate school written for an instructor, the purpose of the literature review is not to display all your knowledge about the topic. The purpose of the literature review is to “catch readers up” on the scholarly conversation surrounding your topic (What has been said about the topic? What’s new?) and to create a space for your research (What does your research add to the conversation?). We publish qualitative, quantitative, and mixed-methods research. Articles should contain a short and succinct methods section. You may include questionnaires or other research instruments in the appendices, if they are relevant to our readership. All research articles emphasize the findings and the applications of those findings to pedagogical issues. Keep in mind that we are, above all, a pedagogical journal with a wide readership, some of whom are well versed in research design and some who are not. Our readership is looking for research findings that make them rethink their teaching, program administration, and/or teacher-development options, not necessarily their next research project. Articles that contain statistical analysis must be written in such a way that a general audience of educators (not just statisticians) can understand the methods and findings. Quantitative research articles should foreground findings rather than the tables of statistical data used to reach those findings. We recommend placing large statistical tables in the appendices. Can I submit my graduate seminar paper to The CATESOL Journal? Graduate seminar papers may be appropriate for submission if the author goes beyond synthesizing the literature on a topic or summarizing a conflict within the field. In a seminar paper, the job of the student writer is to display knowledge for the instructor. However, CATESOL Journal submissions should push people’s thinking further, making them rethink their beliefs and practices. Or, Exchanges can provide readers with a new way of approaching teaching, curricular development, and/or teacher development. Or, they can show instructors how to integrate the latest practices into their classrooms. For an Exchange piece on motivation, for example, consider interrogating the literature, using your classroom experiences to add to or counter a commonly held belief about motivation, and/or crafting a set of classroom activities that takes advantage of conclusions from motivation research. Can I submit my lesson plan to The CATESOL Journal? We welcome pedagogical pieces that focus on innovative approaches and practices. However, pedagogical articles must go beyond simply describing a good practice or providing a set of “how-to” instructions. Instead, the article must be grounded in current research and theory and also put forth an argument or rationale that is somehow new or innovative. Apply research findings or practices from other fields (e.g., how you have crafted peer-response sessions based on performance anxiety research or how you have organized peer-response sessions based on a creative writing workshop model). Call into question previous practices (e.g., how written response forms may not be as useful as discussion in triads). Synthesize previous TESOL or second language acquisition research to come up with a new teaching approach (e.g., how your practice was changed by your combining research from discourse analysis, turn-taking studies, and motivation studies). If you have any questions, please feel free to contact Mark Roberge or Margi Wald (catesoljournal@gmail.com) at any time.